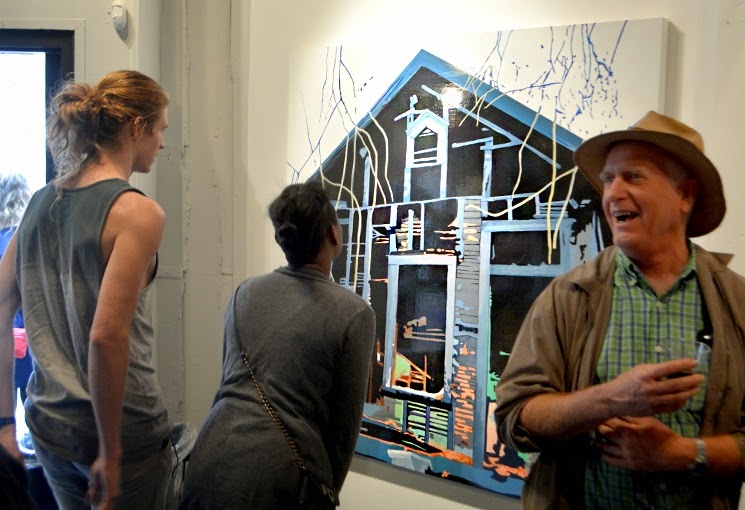 "HOUSE Portraits, HOUSE Painters, Vernacular CRACKER" is the inaugural art showing at VintageATL, a relatively new art gallery + retro furniture story + framing shop in popular and totally hip East Atlanta Village. 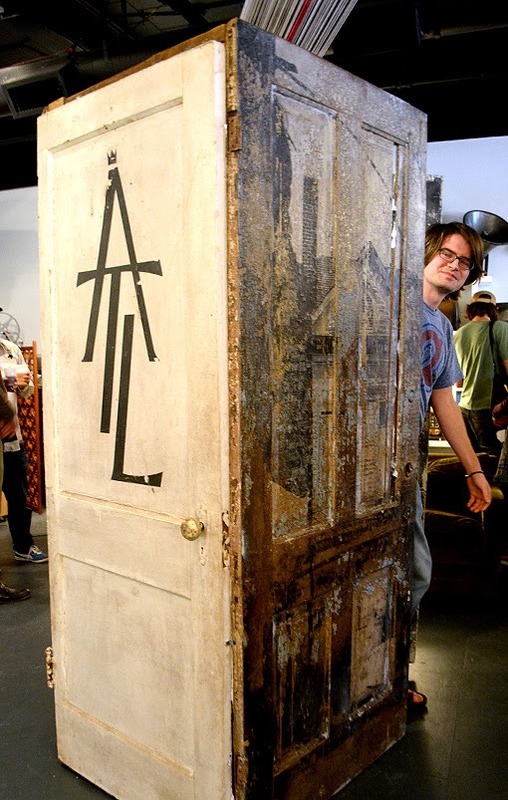 The show features works by artists William Mize, Heather McPherson and Joe Dreher, curated by my friend and fellow blogger Terry Kearns, author of Architecture Tourist, who was recently featured in Creative Loafing! Terry shared with me, "I salute Joe, Heather, William, Gina, JP, and Vivian. It was stunning to learn how hard the artists worked to produce this art to get the pieces ready, AND to get the gallery ready for this show. It was a privilege to be a part of it though; I was just a cheerleader from the sidelines. I want to do this again!" I didn't quite realize it at the time, but when I asked Terry and Joe if I could make a photo of them in front of the "Terry Kearns Mural"—that's what I'm calling it and forever shall—Terry grabbed a couple of others, who serendipitously were right there, to be in the photo...they were the other artists featured in the show, William and Heather! On exhibit through Saturday, May 23, 2015, "HOUSE Portraits, HOUSE Painters, Vernacular CRACKER" is a must-see for any gallery art show enthusiast, fans and students of architecture, and those who enjoy an edgy neighborhood. East Atlanta is quite awesome. 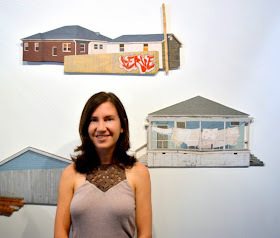 Atlanta-based artist Heather McPherson is showing several of her works, which if I understood correctly are paintings of actual houses in Atlanta. Heather shared with me, "I've been drawing and painting houses for about 10 years. At first I didn't know why I was drawn to them, but over time realized it's that houses contain our private, hidden lives. In looking at the exterior of a house you see small clues of what the interior may hold." Terry told me that Heather's Cabbagetown house paintings were the catalyst inspiration for his wanting to curate the show. Her work is masterful and beautiful...I see why Terry was inspired. If you've visited Fernbank Museum of Natural History in recent years, you've experienced Heather's professional expertise—through the awesome volunteers she manages—and if you'd like to learn more about her art, contact or visit Vintage ATL during the exhibition! I made a new friend! 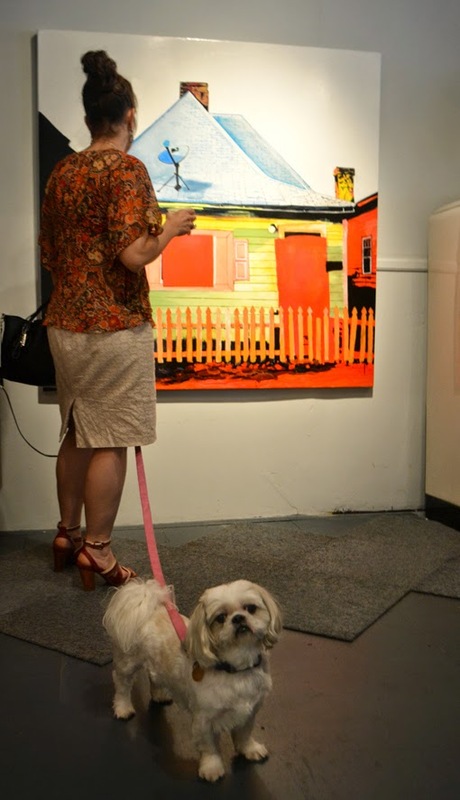 I had the pleasure of meeting "Snow", the canine companion of artist Melissia Fernander. Snow is curious, cute and convivial...and popular. Melissia and I enjoyed chatting about the exhibition and the "Atlanta experience". An artist of note, one of her works is hanging in the Washington, D.C., office of Congressman John Lewis! I don't know if Snow has a political affiliation, but can't you just picture in an adorable little White (dog) House? The photos above and below are William Mize pieces. I quite like his work, especially the piece pictured below. I didn't make the connection at the time, but I've seen Mize's work before--he paints a lot more than houses! One of my favorites of his works is The Climb. I'd seen it on a Museum of Design Atlanta (MODA) "Field Trip" event when we went to MOCA GA (see that post). I love connecting the dots! That's Mahk coming around of the AWESOME photo booth created by artist Joe Dreher. I can't say enough how amazing the people were I met at Vintage ATL. Terry not only curated a fantastic exhibition, he curates awesome friends and fans. By the way, may I remind you that I had the pleasure of interviewing Terry myself in 2013. He's been an inspiration and a friend...he's been an influence in there being a greater variety of what wanderlust ATLANTA covers. If you get to meet Terry when you're visiting Atlanta, you'll immediately recognize his congeniality and his love for this city. That's Kyle of Black Cat Tips—the artist of the character on his t-shirt, just after making a selfie in the (again, AWESOME) photobooth by Joe Dreher. There were so many super nice and super interesting people at this opening event. I must spend more time in East Atlanta Village! 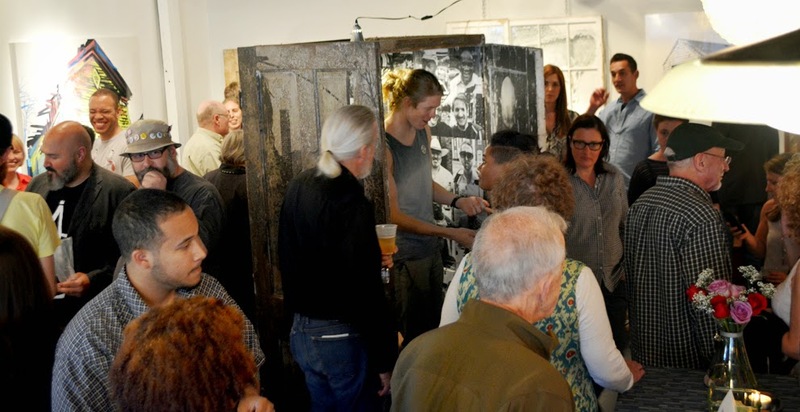 The "Opening Party" was a blast! Check out all the smiles in the above photo. 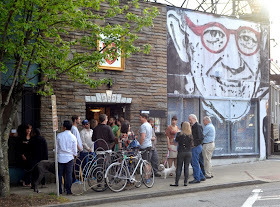 I had a great time meeting artists, locals and fans of Vintage ATL, among them architect Nelson Brackin. Atlanta is a great city for architecture right now...this city is growing! I've always had a great time when playing in East Atlanta Village, but for some reason I've always thought it was more challenging to get to than what it really is. I guess I'd always taken back roads (neighborhood roads) to get there, but on this visit, I took the interstate and was there in practically no time at all. Seen in an Atlanta Journal-Constitution article published in January of this year, East Atlanta Village was named the "Third Hottest Neighborhood in the Country"! And for great reason. It's home to "trendy restaurants, bars and boutiques", a family to which Vintage ATL now belongs. 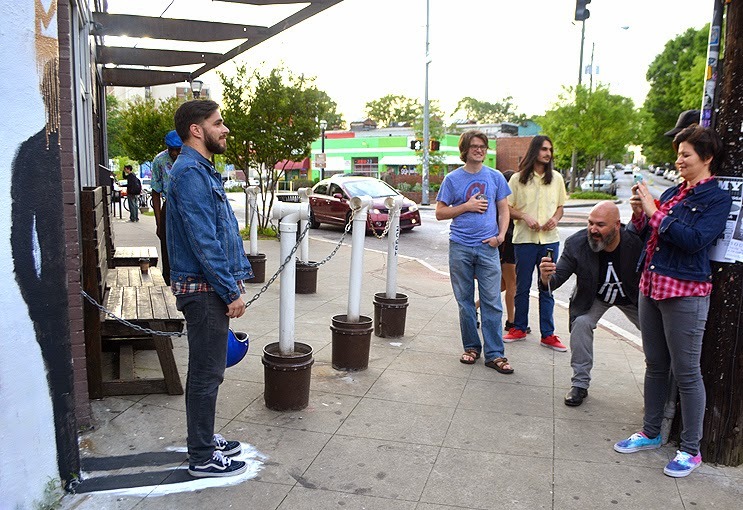 If you're visiting Atlanta, consider adding East Atlanta Village to your itinerary and if you're local, be sure to check out the shops and the East Atlanta Village Farmers Market. The Opening Party was great fun and there's rumor of a closing party! 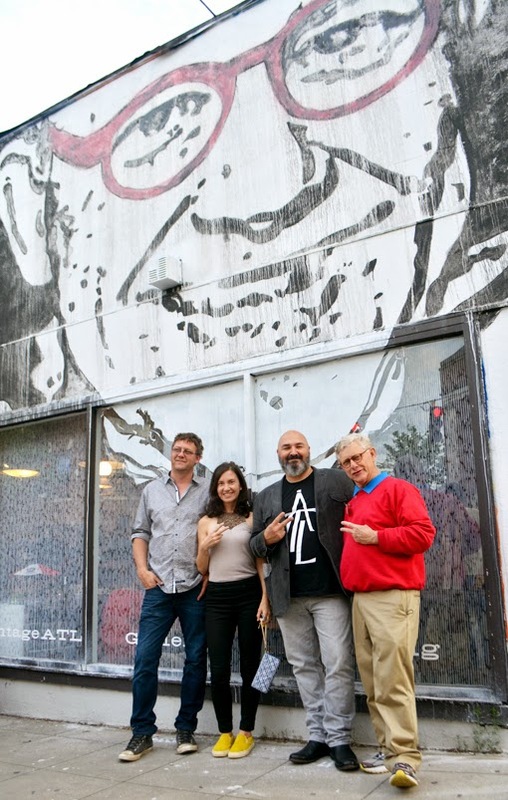 The exhibition—Terry Kearns Mural included—is open through May 23, so keep an eye on Vintage ATL's, Architectural Tourist's and the artists' Social Media channels for an announcement of that event, and other coverage of the exhibition. I got to meet Terry's son, David, who shared with me that he's always been supportive of Terry's being a blogger, which I believe Terry started in retirement. 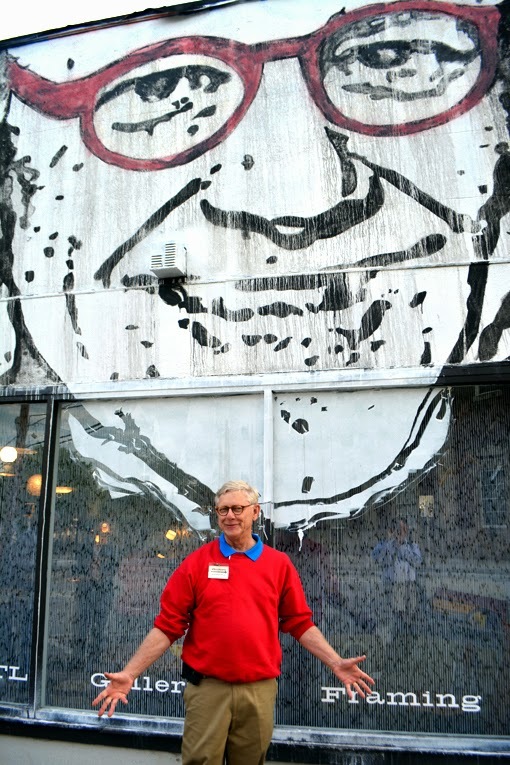 Commenting on the Terry Kearns Mural, David noted that the artist totally got the color of Terry's glasses right...and that he did! 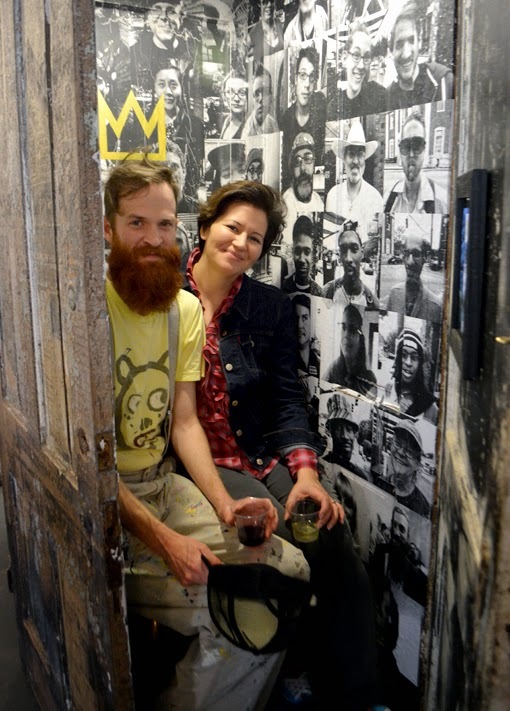 Go see "HOUSE Portraits, HOUSE Painters, Vernacular CRACKER" at Vintage ATL while you can—through Saturday, May 23—and do make a selfie in front of the Terry Kearns Mural. And be sure to check out Terry Kearns' blog, Architecture Tourist! Bravo Travis and thanks so much. We're extending through May 31 when we'll have a bodacious closing party.